Where is Wordsworth Country? The Lake District National park. The Lake District is situated in England's most North West County of Cumbria and easily accessible by road, rail and air. The award winning section of junctions 36 -42 of the M6 motorway provides entries to the area. Exiting at J36 and then along the A590/591 is probably the most used en-route to Kendal, Windermere, Ambleside, Grasmere and destinations on the West Coast. J40 is convenient for Keswick and Cockermouth; J41 for Caldbeck and the Northern Fells, whilst J42 is close to the capital, Carlisle. The rail link is provided by the main London-Glasgow West Coast line. Oxenholme, is the rail equivalent of the motorway's junction 36. This pretty, well kept station is connected by a local line to Windermere with intermediate stops at Kendal, Burneside and Staveley. The station of Penrith is served by bus transfers to various Northern and West Coast Lake District destinations. Or, alight at Carlisle for onward connections to the West Coast. 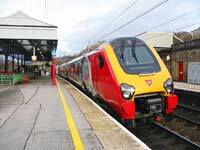 Manchester Airport has a direct rail link to Oxenholme, Kendal, Burneside, Staveley and Windermere. It's a journey of around two hours, where, after passing Lancaster, passengers begin to see the scenic pleasures in store. 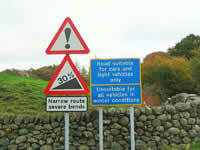 The roads in summer are very busy especially for those travelling to Windermere / Bowness on the A590/591. Delays are not uncommon. Most of the hotels and many of the guest-houses do provide private parking or reserved areas, but for day visitors, parking slots are at a premium. Whichever route you travel, have a safe journey and welcome to Wordsworth Country, The Lake District!